When you have a job to get done, you want minimal distractions sidetracking you from completing the duties at hand. While sound can be enjoyable, it can also be disruptive. Whether you’re a business owner or a self-employed contractor who works from home, you want to complete all of your daily tasks smoothly and efficiently — without the distraction of unwanted noise keeping you from obtaining optimal performance. 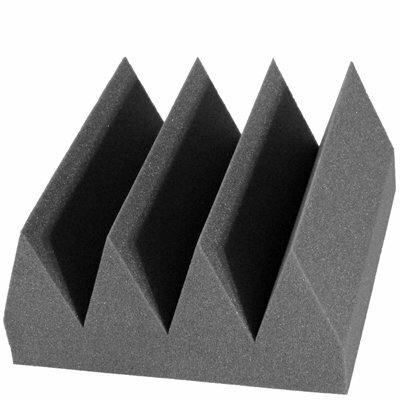 We craft our Udderly Quiet™ Bass Wedge Studio Foam for use in any area needing additional acoustical improvement. 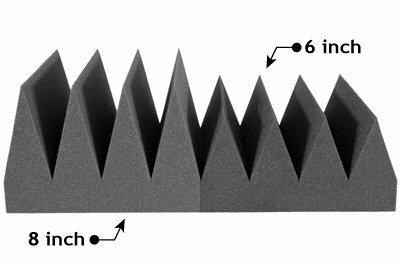 Whether your studio currently suffers from poor low-frequency control or your office needs to block out noise pollutions caused by unnecessary sounds, our 6-inch charcoal bass wedge studio foam is the perfect solution for any soundproofing needs. Udderly Quiet™ Bass Wedge Studio Foam is engineered with thick and durable polyurethane foam material — meaning you’ll never have to worry about a low-quality foam that’s brittle or breaks. Our foam is stronger and firmer than other foams products currently available on the market, providing additional protection against tears, rips or splits in the material. Aesthetical value is important too. That’s why our 6-inch charcoal bass wedge studio foam retains its color for the entirety of its use. At Soundproof Cow, we provide our customers with products engineered for performance for the everyday user. That’s why our materials boast easy installation, affordability and high-quality construction. With a variety of styles and dimensions, we offer a level of customization necessary to guarantee you the right fit every time you place an order. We invite you to contact a representative for further assistance or fill out your order online today! 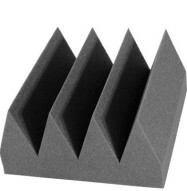 Udderly Quiet™ Bass Wedge Studio Foam was originally designed to reduce low frequency reverberation within recording studio and anechoic chamber environments, however, it will improve the acoustics within any space that suffers from poor low frequency control. Udderly Quiet™ Bass Wedge is a wall mounted sound absorbing panel and has a bold linear pattern that adds architectural interest. 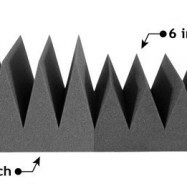 This professional grade studio foam product enhances the sound quality of any recording or listening environment. Engineered for Performance — Udderly Quiet™ Bass Wedge is a thick polyurethane foam product with a deep v-cut pattern that traps hard to control bass frequencies. This style of product was originally created for anechoic testing chambers. Quality — Udderly Quiet™ Bass Wedge Studio Foam products are made with flexible, professional grade, acoustic polyurethane foam. The foam keeps its color better and longer than other lower quality foams. Udderly Quiet™ Bass Wedge Studio Foams are firmer than other studio foam products on the market which adds protection against rips or tears. Ease of Installation — Udderly Quiet™ Bass Wedge Studio Foams are light weight and can be attached to a variety of surfaces. No special tools or materials are needed. Personalization — Udderly Quiet™ Bass Wedge Studio Foams are available in a variety of colors. 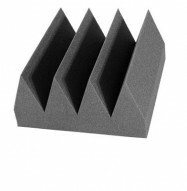 Bass Wedge Studio Foam can be mounted both vertically and horizontally. Architectural Interest — The bold linear pattern of the Udderly Quiet™ Bass Wedge Studio Foams creates a visually unique environment. Flammability — Udderly Quiet™ Bass Wedge Studio Foams are manufactured from polyurethane foam that has a flammability rating of UL94 HF-1. Before choosing this product, be sure the flammability rating passes your local building code for exposed materials. Not just for Professional Studios and Anechoic chambers — Udderly Quiet™ Bass Wedge Studio Foams can be used almost anywhere low frequency reverberation (echo) is an issue. Just be sure local fire codes are met.